On November 11, every year I go over to the Korean War Memorial that was established just about a mile from my home. Years ago I put a stone in the memorial for my Dad who served in Korea as a forward observer. 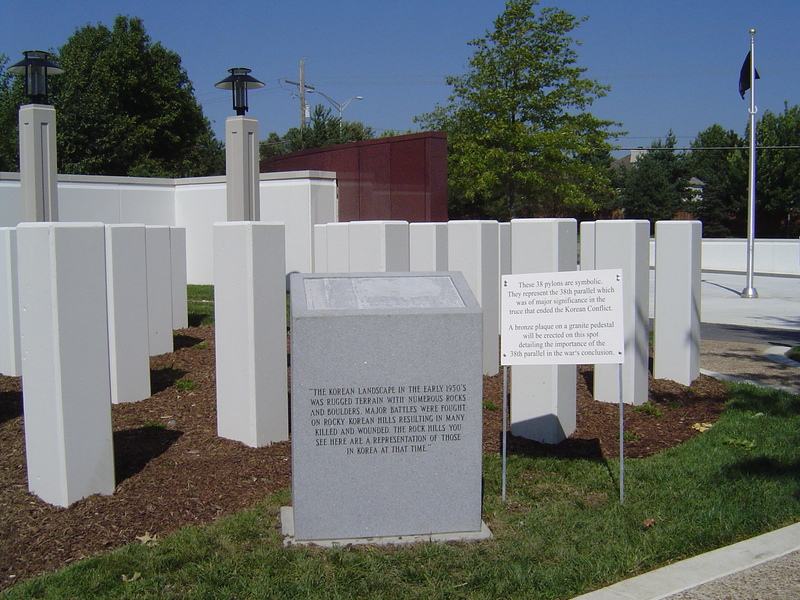 A portion of the Korean War Memorial in Kansas. The truth is my Dad loved military history. He loved reading about the Civil War, World War 1 and World War 2. I have visited many museums just to see them and to think about my Dad. In Kansas City we are fortunate to have the National World War One Museum and Liberty Memorial. It was remodeled over five years ago. My husband and I went to check it out to see if my Dad would be able to navigate its halls and exhibits. We thought he would love it. Unfortunately my Dad passed away before we could take him there. We are also fortunate to have two presidential libraries nearby that also speak about our country’s efforts in war. We have been to the President Truman Library in Independence, Missouri, and the Eisenhower Library in Salina, Kansas. Both have significant information about the Second World War and dedicate a portion of the libraries to the presidents involvement and service. About 14 years ago I went to the National World War Two Museum in New Orleans. I took my children with me; they were then 15 and 11. We walked through the entire exhibit. That day there was a special ceremony in the lobby as veterans were being presented awards. The entire time we were there, we spoke about how much Grandpa would love this museum! I bought my Dad a book and some other memorabilia from the museum. I know he wanted to see it one day. We also visited a small Civil War museum in New Orleans, called the Confederate Memorial Hall Museum. It has been a part of New Orleans since 1891. This small museum supposedly houses the second largest collection of Civil War items. Dad would have loved it as well. I have been to Hawaii and visited the USS Arizona Memorial and seen the droplets of oil floating to the surface of Pearl Harbor, like droplets of tears still escaping. I have walked through the USS Missouri and saw the spot where the treaty that ended the Pacific War was signed. I have visited military cemeteries: Arlington National Cemetery, The National Memorial Cemetery of the Pacific, and the Ft. Leavenworth National Cemetery. I have seen my father buried with full military honors including a flag-draped coffin, the folding and presentation of the flag and a serviceman on the bugle playing Taps. 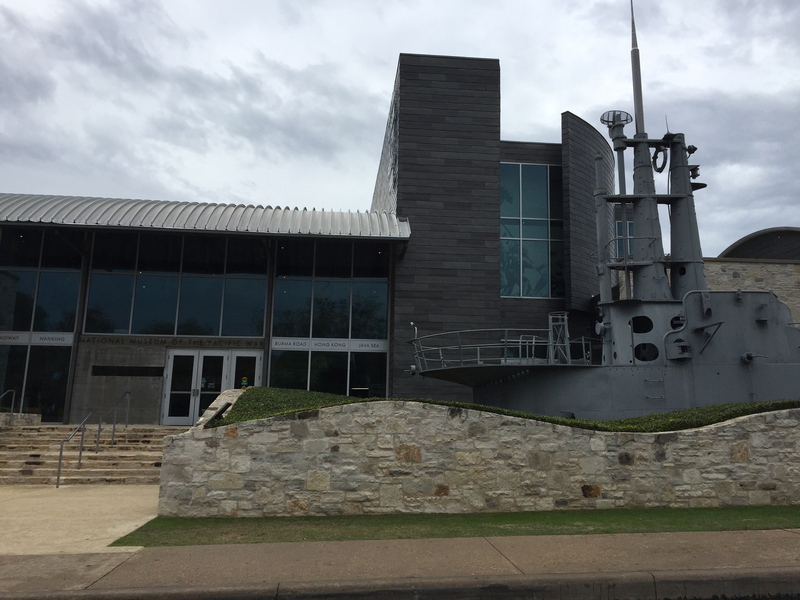 The Museum of the Pacific War in Fredericksburg, Texas. 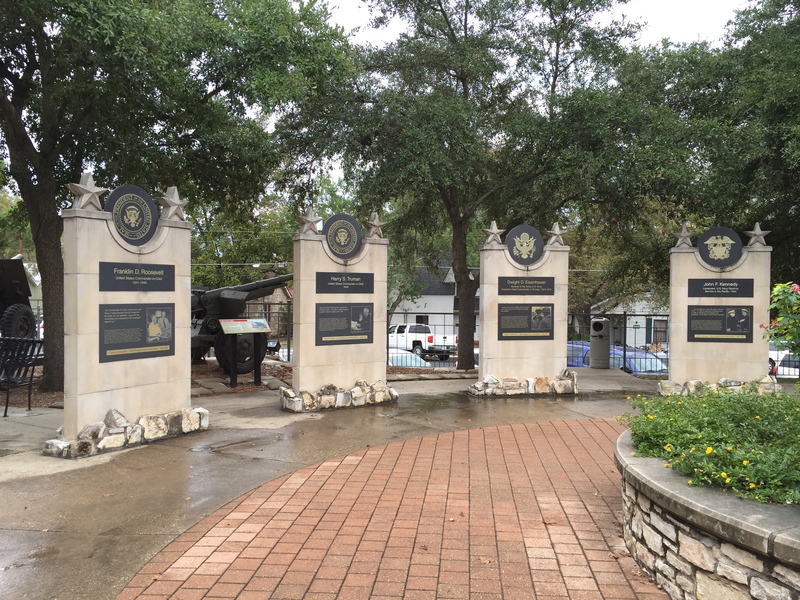 This weekend in my continued efforts to honor veterans and their service, I spent a day in Fredericksburg, Texas. I was in San Antonio for a meeting with my husband. A good friend picked me up from the hotel for this field trip to the National Museum of the Pacific War. Who knew it even existed! We wandered through the halls and learned about what was happening in China and Japan that led to their entrance into the war. We saw planes and submarines. A replica of the atomic bomb hangs from one of the ceilings. I saw information about Manila and the infamous Bataan Death March. That stands out in my memory as my husband’s Aunt Grace was one of the nurses in Bataan. She was one of the few who were evacuated from the island on a submarine and so did not have to suffer through the march and the horrible internment. I was able to show my friend the book, We Band of Angels, which features two pictures of Aunt Grace in group photos. The walkway memorial to presidents. We then walked through a memorial to our country’s presidents to the Nimitz Hotel founded by the family of Admiral Chester Nimitz. It is now a museum honoring his memory and his work as the Admiral of the Pacific Fleet. I believe I honored those who serve by visiting these museums. And always on Veterans’ Day I think of my Dad, who served in Korea. My Uncles Bernie and Stanley who served in World War Two; My husband’s Uncles Ben and Fred who were military physicians in World War Two; His Uncle Richard who served in Korea; and his Aunt Grace and Aunt Florence who were nurses in World War Two. My husband’s grandfather served in World War 1. And not to leave anyone out, I also think of my husband’s and my cousins who served in all of these wars including Vietnam. Museums do not tell the full story. They cannot transmit the heartache that follows a person throughout their life because of the things they saw, the odors they smelt, the lives that were lost and the changes it caused in their psyche. But for me to visit these museums, I feel I am showing respect for the sacrifices these veterans made for all of us. I am proud there are so many veterans in our family!